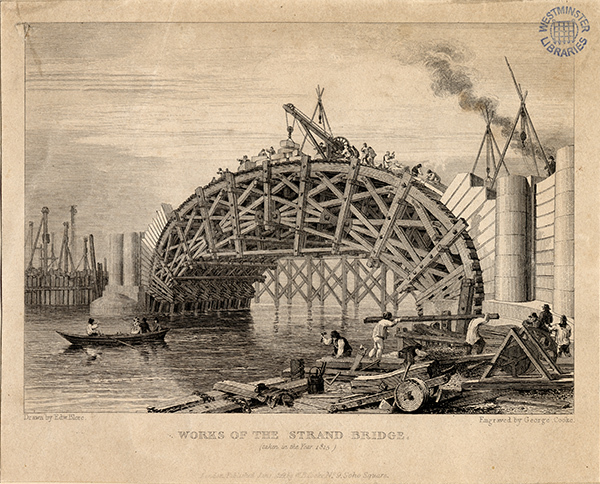 The bridge was originally to be known as the Strand Bridge when John Rennie drew the plans in 1809. However, due to the high sense of patriotism following the culmination of the Napoleonic Wars in the Battle of Waterloo in 1815, the name was changed to the Waterloo Bridge, which has remained its official title since. The bridge officially opened in 1817 as a toll bridge to much fan fare. The Prince Regent along with war hero the Duke of Wellington celebrated the opening with a parade. People from all over the world praised Rennie’s masterful bridge, calling it “the noblest bridge in the world”. Some architectural plans can be found in the Archives that demonstrate the enormity of the project undertaken. Artists visiting London found inspiration in the bridge, including Monet. While people praised the grand arches of the bridge along with the later erected floating Royal Waterloo Bath, a print of which the Archives houses, they did not want to use the bridge due to the toll levied upon it that was not put upon neighbouring bridges. Therefore, later the government dropped the toll after such outcry. 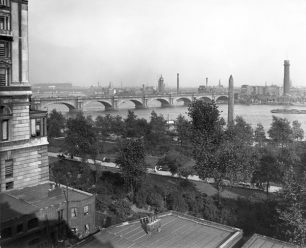 In the 1920s, the Waterloo Bridge has begun to fall into a state of disrepair, needing steel supports. After a drawn out legal battle, it was decided to demolish the bridge and replace it with a new one in 1934. However, the second Great War hampered progress on the project. The responsibility to finish the bridge fell upon women leading to the new nickname for the bridge: the Ladies Bridge. The new Waterloo Bridge designed by the “genius with concrete” Sir Giles Gilbert Scott opened in 1942. While the new bridge uses some of the same ideas of the original with semi-elliptical arches and is an architectural marvel in its own right, it cannot match the grandeur of Rennie’s famed masterpiece. This page was added on 26/05/2017.